If you were born or brought up in Johor Baru in the 1960s, you may have fond memories of walking down Jalan Trus or Jalan Wong Ah Fook, while your nostrils were assailed by the putrid pong from the open sewage known as Sungai Segget. Some of you may also remember going to the cinemas to watch shows at Rex or Lido. These two landmark cinema halls no longer exist and in its former site, stands the towering structure that houses Hotel Amari Johor Baru, Suasana Suites Johor Baru and the Zenith Lifestyle Centre. The landscape here is not recognizable especially as the infamous Sungai Segget is no longer visible and in its place, are covered pedestrian footpaths. 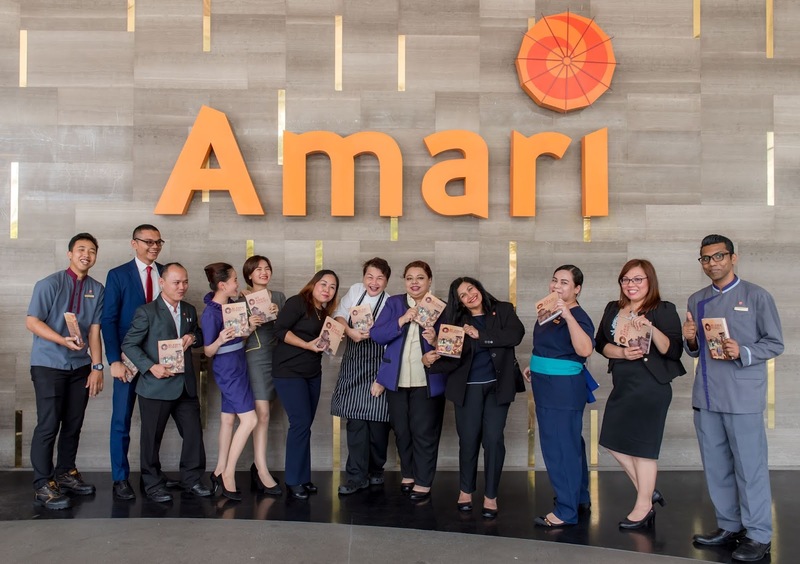 Amari JB is accessible from Jalan Wong Ah Fook by elevator and escalator while vehicles should drive via Jalan Trus to park comfortably within its covered carpark. When I first met Area General Manager, Dean Rossilli, I pointed out that the Amari JB has the unique heritage of being situated on the site of these former landmark cinemas and that the hotel also overlooks Johor Baru’s Street of Harmony where places of worship of our multi-racial community, are located. In addition to my memories of old cinemas in, Escape to the movies, a heritage piece on Johor Baru’s Street of Harmony is also featured in my book, My Johor Stories: True Tales, Real People, Rich Heritage. 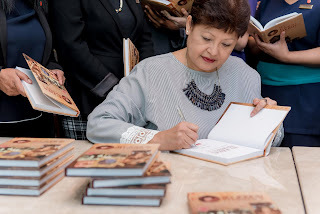 So this book, My Johor Stories: True Tales, Real People, Rich Heritage along with its sequel, My Johor Stories 2: Interesting Places and Inspirational People are provided in selected suites for room guests to read and get to know more about the place they are staying in. Dean and his team agree that travelers would enjoy staying in a place with a story and I believe that after reading about the attractions in our Street of Harmony, guests may even venture to explore further to see these sights for themselves! I’m at the drop-off porch of the ground level hotel lobby off Jalan Trus and my eyes are riveted on the cream-coloured wall of its neighbouring building where a giant mural evokes memories of Rex and Lido. Local artist, Mulo, told me that when he was commissioned for this job, he did online research and stumbled upon my stories on Rex and Lido in my blog, My Johor Stories (peggyloh.com). Distracted by the painted figures that strongly resemble local movie icons, P. Ramlee and Saloma, I walk closer for a look at the details painted in this mural and can identify with the old-fashioned movie billboards and familiar pieces of old movie tickets! In those days, Rex was one of the landmark, stand-alone cinemas where locals would go to watch a movie, seated on flip-up-and-down wooden seats and were cooled by ceiling fans. Much later, Lido, a modern cinema was built on the adjacent site and this was preferred against Rex because it was not only new and had cushioned seats but was also air-conditioned! Guys, who used to wear flip-flop slippers, had the bad habit of removing their footwear and folding up their legs on the seats to get comfortable and watch the show. Maybe the guys were caught up with the exciting movie but when the show was over and they were ready to leave, the guys were shocked to discover that their footwear had disappeared and they had to walk home bare-footed! I’m sure movie-goers at Rex and Lido have their own movie-watching memories and reading this may trigger off their own recollection of experiences, both good and bad. These stand-alone cinemas or theatres remain in our memories now because they are quite unlike the multiple movie halls located within high-tech cineplexes of today. When modern movie theatres started to open within shopping malls, the stand-alone theatres lost out to the newer options. 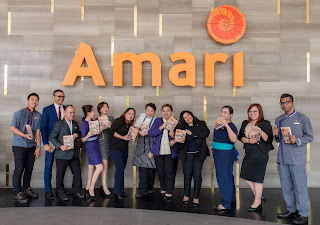 One for the album, Dean Rossili and the team at Amari Johor Baru with my books, Book One and Book Two. When they ceased to be viable to operate, these cinemas were closed. Now, Broadway is the only stand-alone cinema in JB that remains in business. It’s my pleasure to be at the hotel again to meet with Dean and the team to autograph my books before they were placed in their hotel rooms and suites. Everyone is busy checking out my books! With the skillful help of a professional photographer, we have fun while being “shot at” from various angles and at selected sites in the hotel, to capture a few photo mementoes of this special occasion. As the Lunar New Year is just around the corner, I know Amari JB is gearing up to host the stay of (mostly repeat!) guests who have made advance reservations to stay with the hotel during the Johor Chingay season. They know that the hotel’s location commands a distinctive advantage with a panoramic view of the Johor Old Temple or Gu Miao on Jalan Trus, the site where the action starts and ends for this three-day annual street parade. While the Johor Chingay began as a religious festival, it has evolved into a tourist attraction where visitors both local and abroad, will converge upon JB to watch this colourful night parade that happens of the 21st night of the first lunar month. Traffic will virtually be at a standstill because some roads would be closed to facilitate the street parade. Schools and businesses will close early because everyone wants to be part of this exciting event. In recent years, Johor’s Sultan Ibrahim has graced the event from the royal platform set up in front of Johor Baru City Centre or JBCC Mall, which is strategically located directly opposite the Amari JB. So Amari guests have the best of both views as they can watch the parade from street level or from above, in the comfort of their rooms. Amari Johor Baru is at No. 82-C Jalan Trus, 80000 Johor Baru, with it reception desk on Level Six. Tel: 607 – 266 8888. Visit website: www.amari.com for special promotions at the hotel and restaurants. It’s the first year of Lunar New Year celebrations at Trove Johor Baru and I’m happy to accept their invitation to a preview of the delectable dishes in their festive set menu. I like how traditional (round!) banquet tables are arranged in a secluded section of the cool and contemporary ambiance of the Lada & Clove, for our dining pleasure. A quick look at the Auspicious Set menu tells me that the Salmon Yee Sang is part of the set and here, the raw fish is topped with caviar or Japanese fish roe, tobiko. Long wooden chopsticks are provided for the salad toss and we stand together to toss the colourful ingredients with (loud!) wishes for greater prosperity in the coming year! While enjoying this taste, I’m pleasantly surprised to discover an interesting lemongrass flavour in the salad – rather unique to the Salmon Yee Sang served here! 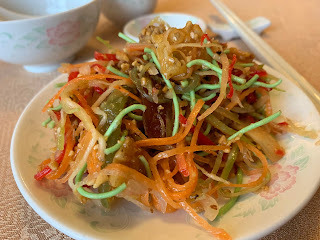 I lick my lips for a final taste of the interesting Yee Sang as I allow the piping hot Double-Boiled Fish Soup with Ginseng and Snow Pear to cool to a more palatable temperature. A tiny sip and I like the natural sweetness of Snow Pear slices and the not-so-herby flavour of the fortifying Ginseng in the Fish Soup. It’s a refreshing change and as I scoop deep into my bowl, I discover that the chunks of fish are lightly fried before being brewed in the soup. The fish is toman or giant snakehead and it’s a generous chunk of this meaty fish in my warm and tasty soup. In the tradition of the Lunar New Year, a whole fish is served and here the fish dish is Hong Kong-style live Tiger Garoupa steamed in superior soy sauce. From my first taste of a tender morsel of flesh, I must compliment the chef for his competence in timing the steaming just right and its tender meat perfectly pairs with the soy sauce! 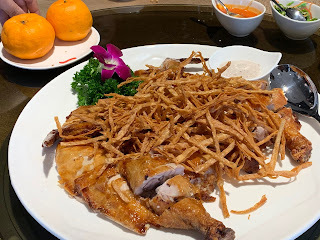 Over interesting conversation, we help ourselves to Roasted Crispy Chicken topped with strips of dried shredded fish, and as the lazy-susan goes round and around, the platter ends up neatly polished! 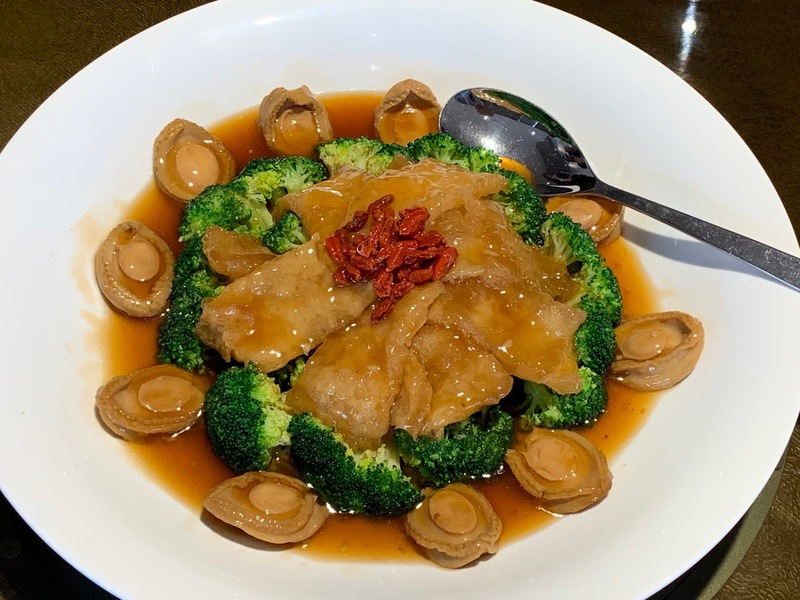 The Lunar New Year is also traditionally the time to enjoy high-value food ingredients with auspicious meanings and the next dish is Braised Abalone with Black Mushroom and Broccoli. In this serving, a ring of broccoli florets is surrounded by whole abalone – one each for every diner – and topped with whole mushrooms and slices of glistening fish maw. 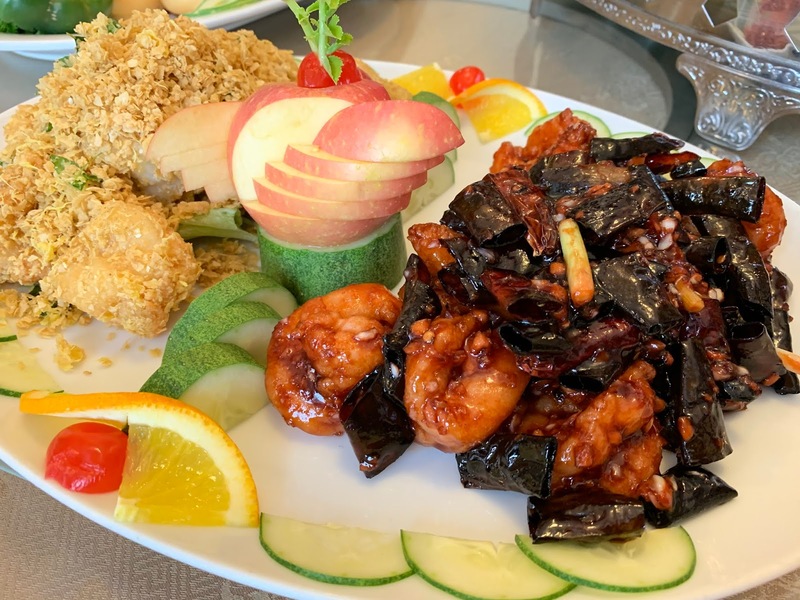 Prawns are another auspicious item to enjoy in Lunar New Year banquets and the pan-fried prawns are presented in three flavours: sweet, sour and spicy. The menu rounds off with steamed Treasure Glutinous Rice in Lotus Leaf and when the platter is unveiled, I can see that the “treasures” are slices of Chinese sausages and waxed meat. Two desserts end our set meal sweetly: Chilled Longan with Sea Coconut and deep-fried Sesame Seed balls stuffed with red bean paste. Three-day advance orders are required for Chef Wong Chee Foong and his culinary team to prepare and serve the set menus. They are the Golden Dragon Set (RM988 nett) and the Crimson Phoenix Set (RM1,188 nett) for tables of 10 and the Auspicious Set for tables of six (RM828 nett) or 10 (RM1,388 nett), presented from now till Feb 19. Reunion Dinner orders for the Auspicious Set on Feb 4, the eve of the Lunar New Year, also stand to win a free room-stay with the hotel in a Lucky Draw! For a leisurely gathering, the traditional Reunion Dinner will be served at 7pm. Upon request, Trove may arrange banquets to be held in private function rooms or in a private section of the Lada & Clove. Lada & Clove is on Level 8 of Trove Johor Baru, located at Jalan Abdullah Tahir, 80300 Johor Baru, Johor. [No pork products are used in the kitchen.] Tel: +607 – 272 8888. For reservations, email: info.trovejb@careluxuryhotels.com or Tel: +6017 818 8036 and +6017 – 818 8043. I’m at Mutiara Johor Baru to dine at the Meisan Szechuan Restaurant again for a preview of their Lunar New Year menu. It’s been some time since my last visit to Meisan and I’m keen to taste familiar items like Szechuan Hot & Sour Soup and Mango Pudding that have earned a reputation here. I ride the escalator to level one where Meisan is located and at the restaurant foyer, my eyes are riveted to the display of ingredients that go into the Yee Sang or raw fish salad. I like how each ingredient is labelled (in English!) and I’m pleased to identify the 13 ingredients that make up the salad that include slices of jelly fish and dried persimmon! I remember the restaurant has two entrances and I’m directed to the left entrance where I’m ushered into a private (familiar!) dining room, designed with one glass-paneled wall which overlooks the carpark and beyond. 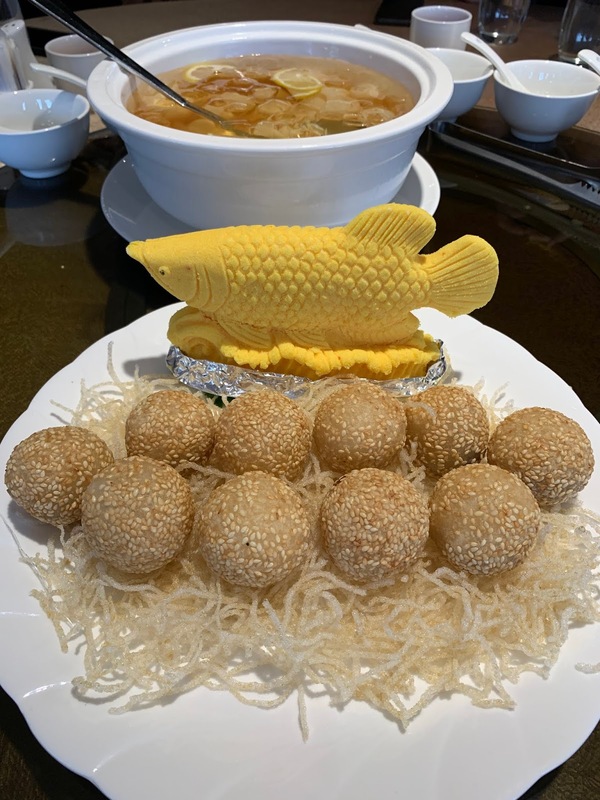 A look at their Lunar New Year menus shows the English translation of set menus dubbed with auspicious names like, “Happiness & Harmony,” “Lucky Charm,” and “Golden Wealth,” that augur well for start of another new year. For the traditional Reunion Dinner on the eve of Lunar New Year, the Meisan offers two time slots at 6.15pm and 8.15pm on Feb 4. As space is limited in the restaurant, guests are also welcome to make reservations to dine in the banquet hall at 6pm. 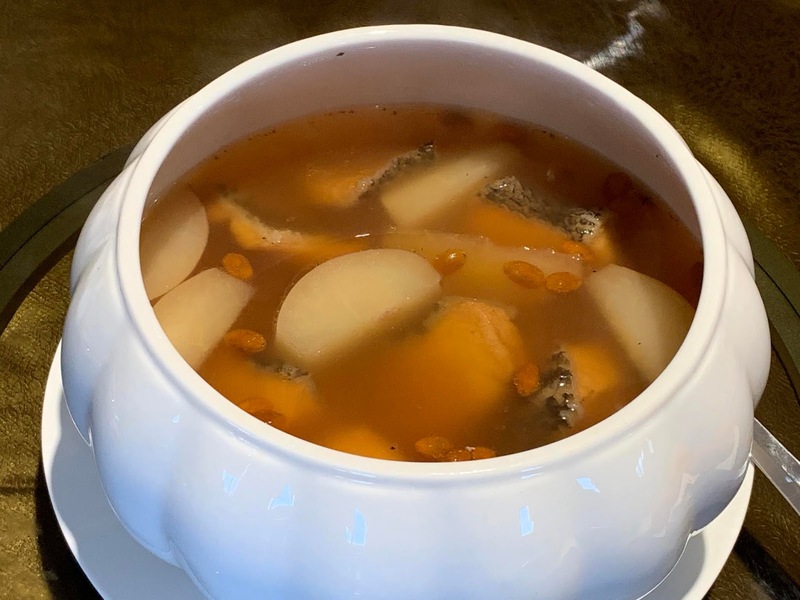 In line with the trend to enjoy banquets without sharks’ fins, it is interesting to note that Meisan presents a choice of superior soups in their festive set menus, prepared with Shredded Dried Scallops, Crabmeat and Fish Lips, as a worthy alternative. Instead of serving one of the set menus, Restaurant Manager, Chan Ket Moi, tells us that a selection of dishes, picked from each of the set menus, will be served in our meal. 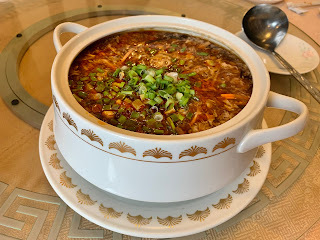 She hands out the Menu for our meal and as I read it, I cannot help smiling when I see that instead of the usual Braised Seafood and Crabmeat Soup in festive meals, they will serve us the restaurant’s signature Szechuan Hot & Sour Soup! 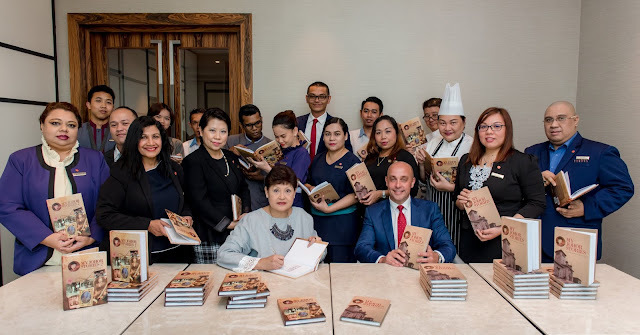 Ms Chan explains that Chef Gey Tuan Hong, who trained under master chefs in Meisan for the past 27 years, is now leading the culinary team in the Chinese kitchen and they are all set to serve the festive menus. Then it’s time to enjoy the meal. “Salmon Yee Sang with Special Sauce” is the description for the Meisan Yee Sang platter. I can see that the single bowl of sauce that comes with this serving, looks rather Red in colour as compared to the plum sauce and other sweet sauces, common in other servings of Yee Sang. 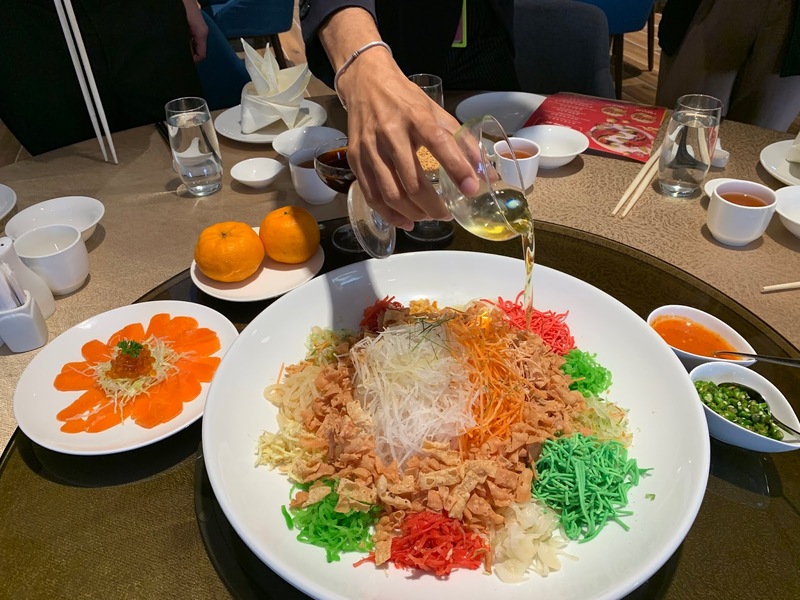 Each ingredient and colour in the salad has its traditional significance and when mixed and tossed high, the Yee Sang dish symbolizes abundance, prosperity and great fortune for the year ahead. In the Lunar New Year tradition, we start the meal by tossing the Yee Sang together to mix the salad thoroughly with wishes for good fortune before helping ourselves to it. At first bite, I can recognise the familiar taste and fragrance of the Meisan Yee Sang! is served within a hollowed-out capsicum! Ms Chan reminds us that the Szechuan Hot & Sour Soup may not be in the Lunar New Year set menus but it is available from the Ala Carte menu. Made with a base of rich chicken broth, this soup served with a drizzle of chilli oil and a sprinkle of chopped spring onions, is filled with slivers of beancurd, black fungus and fish lips for a gelatinous texture. The first sip tastes a bit sharp but my palate gradually adjusts to the hot and sour flavour and very soon I’m enjoying the familiar taste of Meisan’s signature spicy soup to the very last drop in my bowl. Cantonese style Steamed Garoupa is a fish dish featured in most festive menus and connoisseurs of quality steamed fish know that its doneness and the complementing soy sauce matter most. When this whole fish is presented “swimming” in superior soy sauce, the wait staff gently carves the fish before serving it. And even from my taste of a tiny morsel of this smooth steamed fish resting in a dollop of sauce, I privately commend the chef for presenting this steamed dish, timed to perfection! Credit must be given to the culinary team for effort made in plating and presenting the next two dishes. 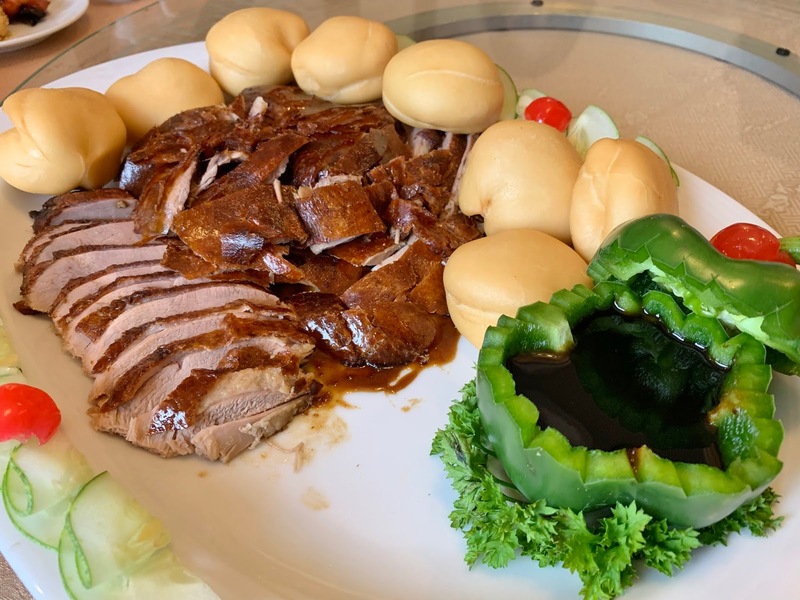 The Szechuan Camphor and Tea Smoked Duck served with mantou buns has its sweet sauce served in a hollowed-out capsicum. In the Twin Delight Prawns, the platter of two varieties of whole prawns in Dried Chilli and Oats are garnished by slices of Red apple, cucumber and orange. I’m chewing the prawns (one after the other!) enjoying the contrasting flavours – one spicy and the other coated with crunchy oats – and cannot help but notice that they are such meaty prawns! A Lunar New Year must-have dish is the auspicious Braised Black Mushrooms and Scallops with Broccoli, made with huge, whole mushrooms and topped with scallops. All the dishes are rather filling and I usually do not have space for the rice dish. But when the individual servings of Steamed Glutinous Rice in Lotus Leaf is served and my portion unwrapped, the enticing aroma makes it absolutely irresistible! A closer look at the steamed rice reveals toppings of high-value ingredients like dried oyster, mini abalone, mushrooms, chestnuts and bits of chicken, with a hint of salted egg for added flavour. This portion tastes so good that I’m not surprised that I finished it! I suspect Ms Chen is hiding a smile when she sees me folding the empty lotus leaf with a sigh of satisfaction. She explains that the dessert in the set menu is Assorted Mua Chi and for the Golden Wealth set menu, the dessert is a twin serving of Durian (Musang King, no less!) stuffed Mua Chi with a side of traditional Chinese pancake sandwiched with Red Bean paste. This is a fitting sweet ending to the delightful set meal: melt-in-your-mouth Mua Chi filled with chilled durian and a slice of warm crunchy Chinese pancake. The Lunar New Year set menus are served from Feb 4 to 19. 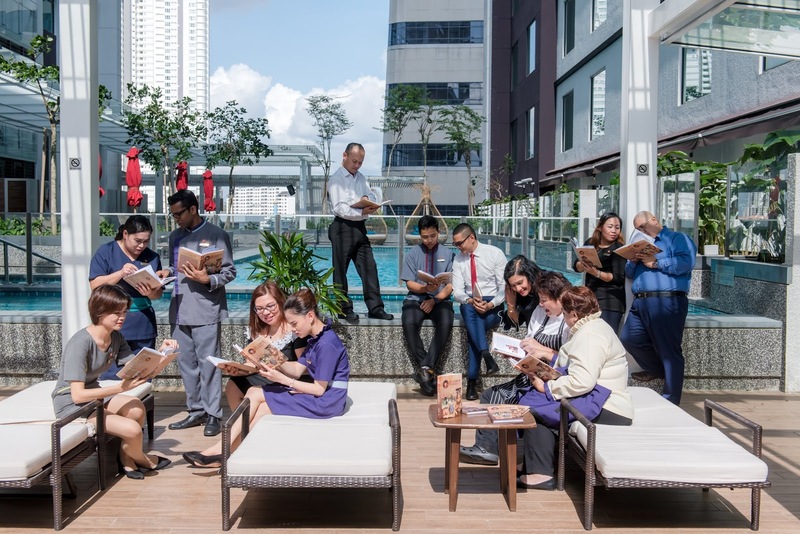 The Happiness & Harmony set for five to seven persons is priced at RM868 nett, the Lucky Charm set for eight to 10 persons at RM1,288 nett and the Golden Wealth set for eight to 10 persons at RM1,888 nett comes with a complimentary Salmon Yee Sang. Meisan Szechuan Restaurant [Pork-Free] is on level one of the Mutiara Johor Baru, Jalan Dato Sulaiman, Taman Century, 80250 Johor Baru, Johor. Open for lunch daily from 11.30am to 2.30pm and dinner from 6.30pm to 10.30pm. Note: Meisan Szechuan Restaurant will be closed on 5 Feb 2019, the first day of Chinese New Year. It’s good to be back at KS Treasures to dine with Frankie, his wife, Diane, and their son, along with a few friends, for a preview of the festive dishes prepared by Chef Benson Chia. 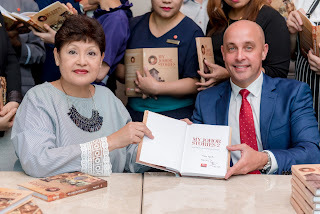 At the launch of KS Treasures last year, I met co-owners, Jeremy Teo, Chef Benson and his wife, May. Now we have the pleasure of dining with Jeremy’s sister, Celine, TS Ng and Yoshiko Tsuchiya of Johor Bahru Gourmet, and her 7-year old son. Johor-born Chef Benson, who is from Segamat, is applying the culinary skills he acquired from an illustrious career with international brand Chinese restaurants from Singapore, Shanghai to Miami, USA. Through skills garnered from his stints with Tung Lok Singapore, the Ritz-Carlton Shanghai, to award-winning Michelin Star Cantonese restaurant, Hakkasan in Miami, Chef Benson is living his dream in serving up culinary creations in his own restaurant. At the table, I’m seated next to Yoshiko and she turns to me with a polite query about my blog, My Johor Stories. Having lived here for five years, she is familiar with local food and we have much to chat about especially since she and her son had just returned from a visit to Ipoh. After tossing the platter of Salmon Yee Sang for greater prosperity and tasting it, I’m ready for the items that Chef Benson has picked to prepare for us from the eight Set Menus and Ala Carte Menu, designed for the festive season. I’m more than ready for something extraordinary and the Braised Three Treasures Dried Seafood Yellow Broth, truly makes an exceptional difference. As I watch the serving staff dish out the soup into individual bowls, I observe the creamy texture of the rich yellow broth – prepared from chicken stock and scallops – filled with shreds of dried scallops, sea cucumber and fish maw. As I sip each spoonful of this superior soup to savour its rich, creamy flavour, I agree that it certainly lives up to its name and reflects KS Treasures reputation for modern gourmet Chinese cuisine. Such a great start sets the tone for our meal and I sit back, hardly able to contain my anticipation for more delights to come. In the Chinese tradition of giving auspicious names to festive dishes, I recognize the voice of Chef Benson behind me saying, “Tai Kat Tai Lei,” as he presents the next dish. The chef comes into my line of sight and he proudly presents the dish of prawns stir-fried in a special sauce created with slices of Mandarin oranges and yellow mustard. At a glance I see that the whole prawns are without shells and are completed coated with the sauce. In this way, I can taste the full flavour of the delicious sauce along with the crunchy texture of the prawns with each bite. While we are happily savouring these tasty prawns, Celine’s perceptive eyes discerned that the kids at our table were not too enthusiastic about such sophisticated flavours. She quickly responded by placing orders for two items that she believes, are all-time favorites, popular with both children and adults: Ebi Shrimp Fried Rice and Fried Chicken Wings. When these items are served, I can see how the adults are tempted to have some. From the way the golden grains of fried rice and the fried chicken wings – tender mid-sections only – gradually disappeared from the platters, these are evidently popular hits! This brief interlude allows the meal to settle more comfortably before the next dish is served: The Chef’s signature Black Truffle Roasted Duck garnished with sautéed mushrooms. This dish is so fusion-like that I can imagine how Chef Benson cannot resist adding a French element to the Oriental preparation of his famous whole roasted duck! And when this platter was retrieved completely empty, it certainly shows how this dish went down (positively!) with us! We are licking our lips and agreeing that the Black Truffle Roasted Duck wins – hands down – when the next dish is served: Stewed Pork Knuckle with Sea Cucumber. Maybe it’s the lighting but this eye-catching dish of a plump pork knuckle sitting in a ring of giant size mushrooms and chunks of sea cucumber, appears to be glistening and glowing! We cannot help but admire the plating and presentation, and agree that we have no alternative but to destroy such exquisite splendor so that we can savour this dish. Then TS requests for a fork and knife and rises to the occasion. He stands up and with skills that rival a trained surgeon, he neatly dissects the tender meat and lifts the bones out! As we applaud TS for his skillful operation (he insists this is his first time ever!) he cuts the pork knuckle into portions. Then we help ourselves to the fall-off-the-bone tender meat and its rich flavours that Chef Benson achieved from painstakingly stewing this dish for two and a half hours! We also enjoy a green leafy vegetable dish before rounding off the meal with Cantonese style Larp Mei Farn or rice steamed with Chinese sausages and waxed duck. This familiar aroma sends me straight back to No. 154 Jalan Ngee Heng, where our grandmother used to prepare this dish for the family during Chinese New Year. Chef Benson tells us that he timed the cooking of this rice dish in a claypot, according to our pace so that it will be ready just on time to serve at the end of our meal. Just as our grandmother did, the chef placed the Chinese sausages and waxed duck meats on top of the rice and are steamed so that its fragrant oils and rich flavours are soaked directly into the rice. The sausages and meat are removed from the rice and sliced, and then served separate from the claypot of rice. At the table, the serving staff adds the sliced sausages and meats back onto the rice and drizzles a special dark sauce over the dish before mixing the ingredients with the rice. Each serving is a bowl of rice mixed with the preserved meats and as I taste each comforting mouthful, I cannot help having a flashback to Chinese New Year at grandfather or Ah Kong’s house where our family had a tradition of eating this fragrant rice dish. I know Chef Benson is mighty proud of this dish and I congratulated him on serving such an agreeable, nostalgic taste. The chef generously accepted my comment and goes on to explain that the Chinese sausages and waxed products of today cannot be compared to those of yesteryears. I agreed that this is because in a bygone era, the China products were preserved with high quality wine and ingredients, quite unlike what is happening now. The chef explains that the preserved meats used at KS Treasures are premium products from Hong Kong [I can picture the type traditionally shipped out in metal tins!]. Like the others around the table, I’m more than satisfied with this spectacular meal and am ready to end sweetly with dessert. Our dessert is a platter of Chinese style Pumpkin Puree with a hint of coconut milk, similar to Teochew Or Nee (Yam Puree). Just like Or Nee, a serving of the pureed pumpkin may not look good but everyone agrees that it certainly tastes so good! A glance at the Set Menus shows a price range from as low as RM788, RM988, RM1,188 to as high as RM4,688 for a table of 10 persons. Chef Benson has also prepared a Chinese New Year Ala Carte menu of festive dishes and in our meal, the prawn dish and the steamed rice are from the festive Ala Carte menu. To allow sufficient preparation time, one day advance notice for reservations of set menus is recommended. Tel: +607 – 665 1133. Open daily, from 11.30am to 3pm and from 5.30pm to 10.30pm, with an afternoon break. 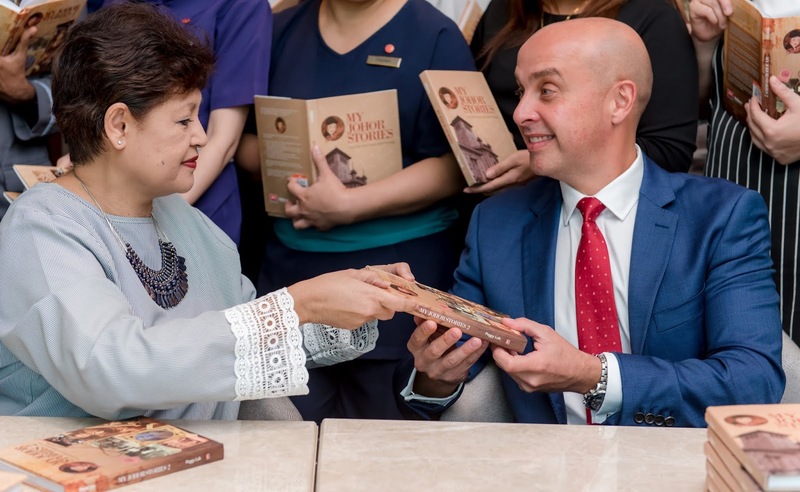 The Lunar New Year is just around the corner and Qing Palace, the award-winning Chinese restaurant at Pulai Springs Resort, is one of the preferred destinations to celebrate with authentic Cantonese-Szechuan cuisine by Master Chef Lim Ming Chong. At the preview of the Chinese New Year festive menu, a few dishes have been selected from the various sets for us to sample and remind us why the Qing Palace remains popular with diners over the years. Chef Lim has planned menus that are suitable for family reunions and gatherings with friends with traditional dishes designed with symbolic Chinese expressions of good fortune, prosperity, happiness, wealth and abundance for the Chinese New Year! This of course, includes the serving of traditional Qing Palace Special Yee Sang with Royal Abalone Slices. I am pleased that the serving staff is conversant with the Chinese tradition of uttering positive wishes as she adds the various toppings onto the platter for us to toss for greater prosperity in the lo hei tradition. Qing Palace, renowned for their Camphor and Tea Smoked Duck, serves the boneless version with a side of fried mantou buns complemented by a drizzle of delicious sweet sauce. When I sink my teeth into the tasty, tender meat, I nod my head with approval because it tastes as good as it always did! The skill of the chef is proven in the dish of Hong Kong style Steamed Dragon Garoupa where the steamed fish is timed to perfection and is paired with tasty superior sauce. Szechuan Chilli Sauce flavours on the Fried Prawns is simply lip-smacking and this is followed by the traditional Chinese New Year dish of Braised Sea Cucumber with Black Mushrooms and Greens. Steamed Glutinous Rice in Lotus Leaf is another popular dish on the menu and the preview ends with dessert of deep-fried traditional Chinese New Year Cake, nian gow or kueh bakul. I like how this traditional favourite is sandwiched between a slice of sweet potato and yam, and the triple layered cake is dipped in batter before being deep-fried to crispy golden-brown. Set Menu A is priced at RM880+ for table of 10 and RM528+ for table of 6 persons. Set Menu B is priced at RM1,300+ for table of 10 and RM780+ for table of 6 persons. To accommodate the modern trend of enjoying a restaurant Reunion Dinner, Qing Palace offers three dining sessions scheduled at 5.30pm, 7pm and 8pm on the eve of Lunar New Year, Feb 4 to usher in the coming Year of the Boar. Feasting on high-value ingredients and dishes with auspicious names is a must this festive season and Qing Palace offers three Chinese New Year Set Menus, A, B and C for tables of 10 or 6 diners, served from Feb 5 to 19, for both lunch and dinner. Set A is priced at RM818+ for table of 10. Set B is priced at RM938+ for table of 10 and RM558+ for table of 6 persons. Set B is priced at RM1,388+ for table of 10 and RM828+ for table of 6 persons. 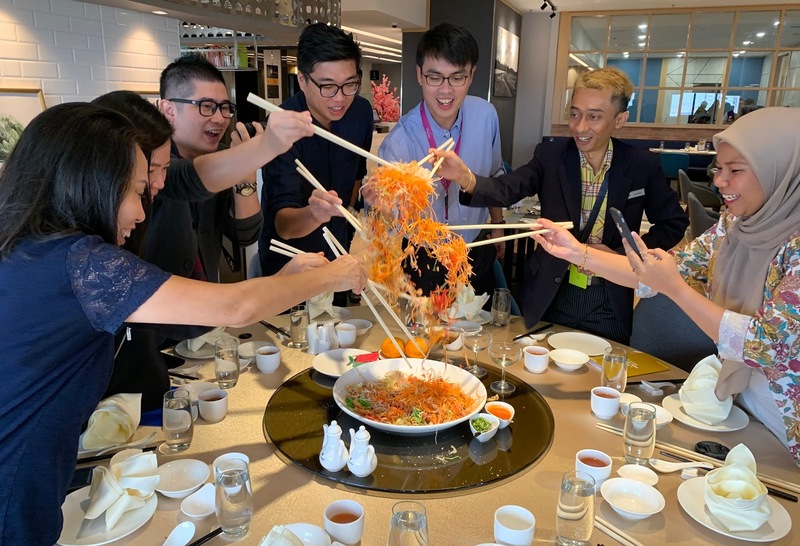 Diners may choose from Yee Sang options in two sizes that feature salmon: RM68+ (small) RM128+ (large), Royal Abalone Slices: RM68+ (small) RM128+ (large), dried seafood: RM78+ (small) RM138+ (large) or smoked duck: RM78+ (small) RM138+ (large). On Feb 4, the all-day dining Cinta Terrace Restaurant will have a Chinese New Year Prosperity Reunion Barbecue Nite Buffet. This is priced at RM88+ per adult and RM44+ per child. Bookings before Jan 31 will save RM15 per adult from the original price. Bookings for groups of 10 guests or more will enjoy RM18 savings per adult. On Feb 5, there is a Day One, Chinese New Year Day Special High Tea from 12pm to 2.30pm at RM58+ per adult and RM29+ per child. On Feb 6, there is a Day Two, Chinese New Year Day Special High Tea at RM48+ per adult and RM24+ per child. For every four paying adults, one child dines for Free. If you are in the resort on Feb 7, the third day of the first lunar month, don’t miss the Lion Dance performance at the hotel lobby, scheduled for 10.30am. Cinta Terrace Restaurant is Halal certified.